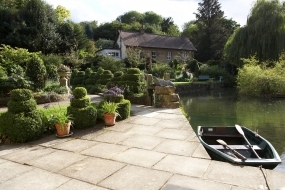 Mill Dene is set in an Area of Outstanding Natural Beauty and has at least 12 gardens of national, if not international, importance within a 20 mile radius, such as Hidcote and Kiftsgate. Wendy Dare, who used to be the National Gardens Scheme Organiser in the area (and, incidentally, a judge at Chelsea Flower Show,) is happy to give advice. This romantic garden is set around a lovely mill which is probably Norman. Sited in its own steep sided valley, the garden has hidden paths winding up from the mill-pool and stream at the bottom through the Rose Walk to the Cricket Lawn. Blockley is a lovely village, not known to many. It is about 15 miles from Stratford upon Avon, half an hour from Cheltenham Races and shopping, and about 30 miles from Oxford. Good food is available in the village or in any of the villages nearby. Mill Dene is on the Heart of England Way, one of many lovely walks, and is near the Cotswold Way. At the very top, there are views over the Cotswold Hills, with the church as a backdrop. Also featured are a grotto; a potager; a trompe l'oeil and dye plants. The garden has been designed by Wendy Dare with help from Rupert Golby (RHS Chelsea prize winner) and flowers are chosen for scent wherever possible. We are currently looking for an experienced gardener to join our team, one or two days per week. If you are interested please send your CV to Wendy Dare at the address below.